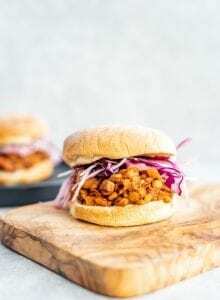 Sweet, tangy, smoky and salty, you’ll love this lentil Sloppy Joe mixture served over toasted buns. Enjoy on it’s own or top with coleslaw, onions, avocado or any other desired toppings. Give the dried lentils a good rinse to remove any dust or debris then add them to a pot with the 2 1/2 cups of water. Bring to a boil over medium-high heat then reduce to a simmer, cover and cook for approximately 20 minutes until the lentils are tender. Drain off any excess water. When the lentils have about 10 minutes left, add the onion, peppers and garlic to a pot with a splash of water or vegetable broth. Cook over medium heat for 5-6 minutes, stirring occasionally until softened. Add the rest of the ingredients, including the cooked lentils. Continue cooking and stirring until the mixture has thickened up. This should take about 10-15 minutes. Serve over toasted buns of choice, adding toppings of your choice such as sliced onions or coleslaw, if desired. The leftover lentil mixture can be stored in the fridge for up to 5 days. Try it in tacos or on its own, over a baked potato or as a lentil chili.